Note: Balmain, Bondi Junction, Chatswood, Castlecrag, Darlinghurst, Kensington, Paddington, Pyrmont, Potts Point, Surry Hills, Woollahra are Sydney's suburbs. 500 Oxford Street (Westfield Mall) / Bondi Junction. Brands: Aesop, Annick Goutal, Atkinsons, Aerin, AROMATHERAPY CO, Amouage, Acqua di Parma, Armani Prive, By Kilian, Clive Christian, Creed, Costume National, Chanel Les Exclusifs* (@Market Str), CHOPARD Haute Perfumerie, Crabtree & Evelyn, Glasshouse Fragrances, Jo Malone, Jean Patou, Juliette Has A Gun, Kiehl's, Lubin, L'Artisan, Molton Brown, Memo* (@Market Str), Maison Balzac, Memo, Philosophy, Parfums De Marly, Penhaligons, Robert Piguet, Shay & Blue, Tom Ford Private Blend. The list is common to all branches in Australia. There's a store finder on every page of a particular product, showing, whether the product is stocked at 'your' store. Brands: at least Atelier Cologne**, Amouage, Aesop, By Kilian, Cire Trudon, Carthusia, Costume National, Creed, Dear Rose, Frapin, Floris, Helmut Lang, Juliette Has a Gun, Keiko Mercheri, Le Galion**, Lubin, L’Artisan, Mark Buxton, Penhaligon’s, Robert Piguet, Rance. Brands: 100BON, ALTAIA, BYREDO, Bastide, Chantecaille, Ciaté London, Comme des Garcons, D.S. & Durga, Diana Vreeland Parfums, Diptyque, Eau d'Italie, Editions De Parfums By Frederic Malle, Escentric Molecules, FORNASETTI, Jo Malone London, Kai, Le Labo, Maison Francis Kurkdjian, MAISON Martin MARGIELA, Malin+Goetz, Nomenclature, Philosophy, Serge Lutens, Terry de Gunzburg, TOCCA. The list is common to all branches in Australia. There's a store finder on every page of a particular product, showing, whether the product is stocked at 'your' Mecca store. Brands: Annick Goutal, Acqua di Parma*, Chantecaille**, Cire Trudon. Brands: at least Acqua Di Parma, Amouage, Czech&Speak, Etat Libre d'Orange, Frapin, Geo. F. Trumper, Naomi Goodsir, Penhaligon's, Santa Maria Novella, Truefitt & Hill. Additionally these brands are listed by the homepage of the store: Annick Goutal, D.R. Harris, Eight & Bob, Juniper Ridge, L'Artisan Parfumeur, Nasomatto, Taylor of Old Bond Street. The list is common to all stores. Brands: Goti, Grossmith London**, G.Nejman, Parfums Micallef. Brands: Arty Fragrances, Carthusia**, Cote Bastide, Fragonard. 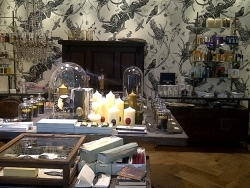 Brands: Arquiste, Cire Trudon, Eight&Bob, Grandiflora, Goldfield&Banks. Most probably also Henrik Vibskov, Parfums Quartana. Brands: Annick Goutal**, Acqua di Parma, Costes, Dear Rose, Fornasetti Profumi, Juliette has a Gun*, Honore des Pres*, Linari*, Lubin, Parfums Nicolai, Robert Piguet, Tom Dixon, Voluspa**. Brands: Baxter of California, Carner, Etat Libre D’Orange, Gallivant, Goldfield&Banks, Truefitt & Hill. Brands: 19-69, Baxter of California, Miller et Bertaux, Maison Louis Marie. Most probably also Agonist, Carner**, Diane Pernet. Brands: Astier de Villatte, Arty Fragrances, Fragonard. Brands: Baxter of California, Linari*, Penhaligon's, Truefitt&Hill. Brands: Floris, Penhaligon's (men's range). Probably also Taylor of Old Bond Street. Additionally these brands are listed by the homepage of the store: Annick Goutal, Armani Prive, Bond No 9, Caron, Charriol, Comme des Garcons, Guerlain (incl. some classic Guerlains), Jean Patou, Juliette has a Gun, Neotantric Fragrances, Penhaligon's, Robert Piguet, Romeo Gigli, Thierry Mugler Miroir Collection etc etc. The list is common to all stores as well as to online store. Brands: Dear Rose, Etat Libre d'Orange. Brands: Astier de Villatte, Cire Trudon (@ Palm Beach). Brands: Agraria, Crabtree&Evelyn, The Laundress. Brands: Juniper Ridge, MCMC Fragrances. Brands: at least Amouage, By Kilian, Cire Trudon, Comme des Garcons, Creed. Brands: Juniper Ridge, MCMC Fragrances, Room 1015, Saint Rita Parlor. Sydney Airport, AMUSE BEAUTY (Terminals 2 & 3): at least Bond No 9, Dear Rose, Jo Malone. Pictures by: yury-prokopenko@ Flickr. That's one of the most brilliant photographer on Flickr, especially when it comes to pictures of Australia!